Capturing the essence of Romania in downtown Bucharest might be a challenge. Together with the guides from the project ‘Art in Bucharest’, we take Romanian artists one by one, discovering their works of art and studios. Check this section for more stories of life and art in the capital city. Who could have imagined that only 10 minutes walk from Unirii Square hides another gem of the art scene in Bucharest? Adrian Naidin’s studio next to ‘Dealul Mitropoliei’, is a very welcoming place, on the top floor of a pleasant old building. Once I entered, I understood it would be difficult to leave in a hurry. Adrian managed to charm me with his music in a way that few artists have done before. He is the kind of artist who is always searching for variety. He plays the cello, the ‘caval’- a type of long flute - and he sings, especially when playing traditional Romanian songs. 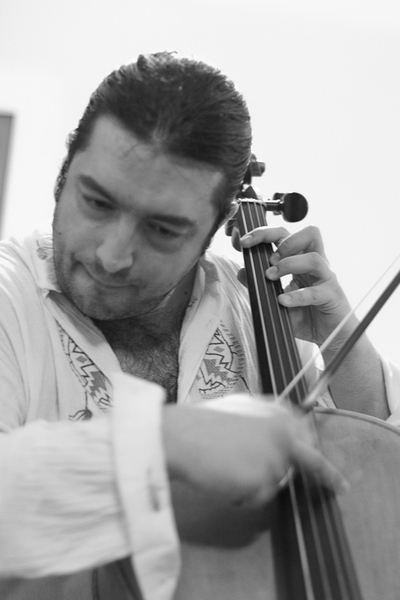 He graduated from the Music Academy of Cluj-Napoca, after studying cello and Chamber Music and he is a member of the Bucharest’s National Radio Orchestra. I knew only a few things about cello music before I saw Adrian playing in a concert at Sala Palatului. His performance was both strong and delicate at the same time and enchanted the hall, rousing the audience to continuous applause. Now, a few months later I have been given the chance to meet him and have found even more reasons to admire his work. He loves Romanian authentic folklore, he respects the true Romanian values (‘neaoș românesc’) and he proved to be as welcoming as a Romanian villager when I brought a group of visitors to his house. It is true he comes from Transylvania, where hospitality is highly valued. While drinking flavored home-made wine and sitting in very comfortable seats in the living room, Adrian sprung a delightful surprise: an impromptu concert. Adrian was visibly enjoying having an audience in his own home. He carefully pulled his cello out of its case and took a seat in the middle of the room. No rush, all quiet! Then he started: first some smooth classical music, then some jolly Flamenco, followed by his own compositions, strongly influenced by Romanian folklore. Every note of Adrian’s music moved. It was even better than a concert in a big hall, with a large audience; this time, the intimate performance was especially for us and we quickly became his greatest fans. Adrian took us to another level of understanding music, extraordinary, sensitive and passionate. He played for more than an hour and he didn’t hesitate to improvise from time to time, showing good mood and deep concentration at the same time. Who wouldn’t tremble when listening to his magic words: ‘Arunca-m-aș pân’ la stele / Pentru dragul mândrei mele!’ – ‘Shall I throw myself up to the stars / For the sake of my sweetheart!’? After the last song the musician admitted ‘it is the first time I have had an audience to sing for in my own house’. It was a special first-timer for us too and we thank Adrian Naidin for that. Listen to one of his songs below. Art in Bucharest takes art lovers to the artist’s universe and presents the rarely glimpsed creative side of Bucharest. In the studios, visitors have the chance to get a glimpse at the inner sanctum of the artist’s world.